When I entered the Great Pyramid of Khufu, or Cheops, a surprisingly commonplace odor greeted me. I was taken to the Pyramids for the first time by an Egyptian, a journalist friend. Before setting out he had entertained me handsomely to some typical Arab cuisine and I had made a hearty meal of shish kebabs, chunks of lamb and vegetables roasted on skewers, washed down with generous drafts of arak, a strong local drink, off-white in color, drunk slightly diluted with water. We had eaten the meal in the accepted way, with our fingers, and the pungent smell of the lamb still clung to us. 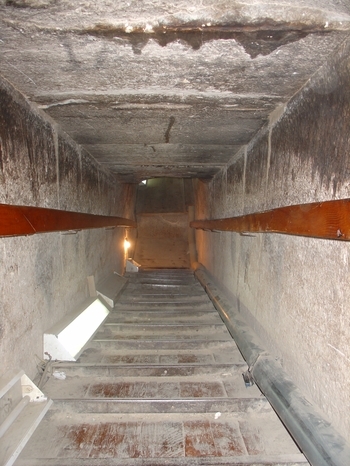 Wandering up and down the stairs inside the Pyramid our hands rubbed continuously Against the handrails, as those of countless Egyptians had done before us. In doing so, we were all transferring the odor of our meal into the rails, with the result that Cairo’s omnipresent smell of mutton is even part of the still air in the innermost chambers of the centuries-old Pyramids at Giza. Most visitors to the Pyramids want to climb to the very top of these mountainous monuments. There is an ancient inscription which refers to them as the “slopes to heaven,” perhaps reflecting the desire of the Pharaohs, which was to reach the sun after death. I, for one, would have liked to have had the experience of standing on the very summit of a Pyramid, but scaling one of their steep slopes is considered dangerous and it is forbidden to climb to the top. This was not always the case, and at one time there was an official guide dubbed the “Acrobat King of the Pyramids.” A slightly built man, Nefnawi Faid is now around fifty years old, but he is still famous for holding the record for the shortest time in scaling the Great Pyramid of Cheops—an amazing five minutes and thirty seconds to the top and back again. 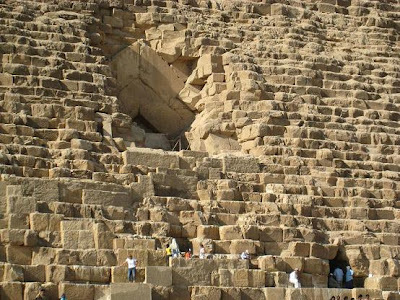 Nefnawi Faid first climbed the Pyramid when he was twenty-six. His performance came to be famous and his scaling of it became the regular conclusion to a visit to Cheops’s tomb. Born in the nearby village of Mena, the Pyramids were his life. Heads of state and senior government officials on state visits have stood amid the crowds and shouted encouragement to the little man. A list of his excited cheerers would read like an international Who’s Who— Nasser, Nehru, Sukarno, Chou En-Lai and Aneurin Bevan. When Khrushchev saw the performance he presented him with a gold watch. Yugoslavia’s Tito, on witnessing it, gave him a gold cigarette case. King Faisal, a monarch rarely moved by anything, watched the performance with a look of disbelief on his face, and when Faid reached the ground he is said to have surprised him with 1,000 Egyptian pounds (approximately U.S. $2,500) on the spot. In his climb to the top of the Pyramid, Faid faced danger daily and never knew whether he would see another tomorrow. And so the story goes that when Faid received the generous present from King Faisal, he promptly announced that he would be taking a holiday and go drinking with his friends until all the money was gone! Apparently, the secret of climbing a pyramid is not to do it in a straight line, but to zigzag up a side. Balance is extremely important, and it is vital to concentrate every second. Whatever happens, one must not be distracted from the climb. At the time it was built, Cheops Pyramids was 480 feet high. But it has been eroded to 450 feet. The top does not come to a point, but is square and flat. Originally it was only 10 feet square, but the effects of erosion have taken their toll and the top now measures 33 feet square. What sort of man was Cheops to have had at his disposal the organization and technical skill required to construct these great masses of stone? Some say he was a powerful and cruel tyrant who sought only personal glory. But perhaps the masses who actually built the Pyramids were content with the belief that participation in the construction of the monument for the king’s “life after death” would secure them a small corner in that same world. Southwest of Cheops’ Pyramid stand the other two Great Pyramids of Chephen and Mycerinus. The Great Sphinx is located a little to the east of them. The Sphinx, its face the face of the ruler Chephen and its body that of a lion, gazes over the desert typifying everything that was Egypt in the days of the Pharaohs.